FIGURE 7. Live adult male Acanthosaura phuketensis sp. nov. in situ at the type locality of Cyrtodactylus ranongensis in Suk Samran District, Ranong Province, southwestern Thailand. 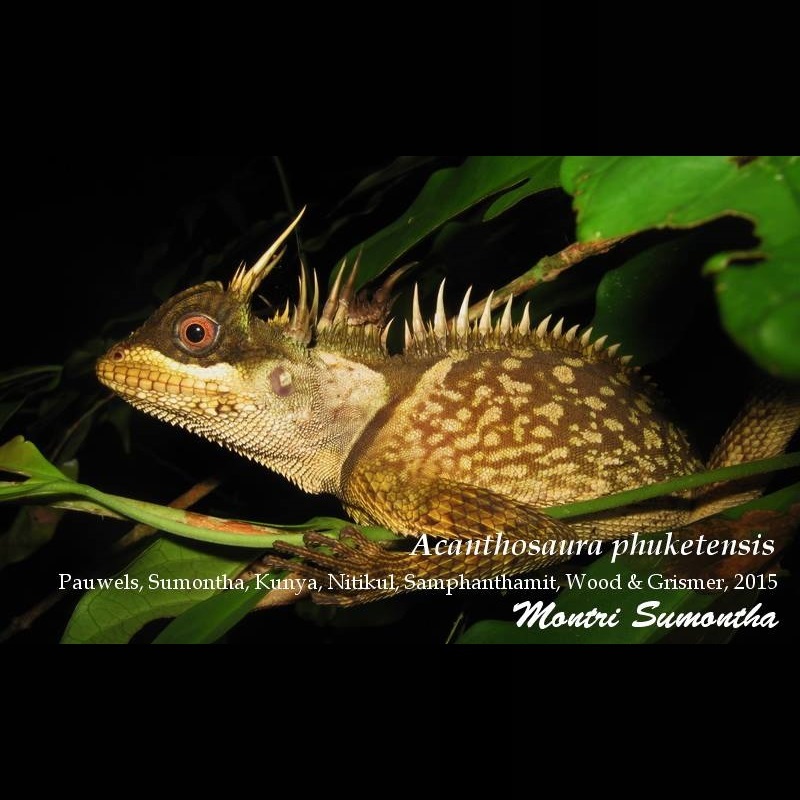 We describe a new lowland forest-dwelling species of the genus Acanthosaura from Phuket Island and the Phuket mountain range in southwestern Thailand. Acanthosaura phuketensis sp. nov., the 11th species in the genus, seems most closely related to A. crucigera from Myanmar and western Thailand and A. cardamomensis from the Cardamom Mountains, but can be differentiated from them by a combination of morphological and coloration characteristics. This new discovery stresses the importance of preserving the last forest patches remaining on Phuket Island, home to three other squamate endemics. Our comparisons show that Acanthosaura phuketensis sp. nov. is clearly distinct from all the currently recognized species of Acanthosaura, and that it is part of the A. crucigera group, in which it seems most closely related to A. crucigera and the geographically distant A. cardamomensis. Its description is just one more step in the taxonomic review of the A. crucigera group, which is already known to include several additional undescribed species in the Thai-Malay Peninsula (Wood et al. 2010, Grismer 2011, Wood et al. in prep.). Similarly, the lepidogaster species group appears to comprise several undescribed species (Ananjeva et al. 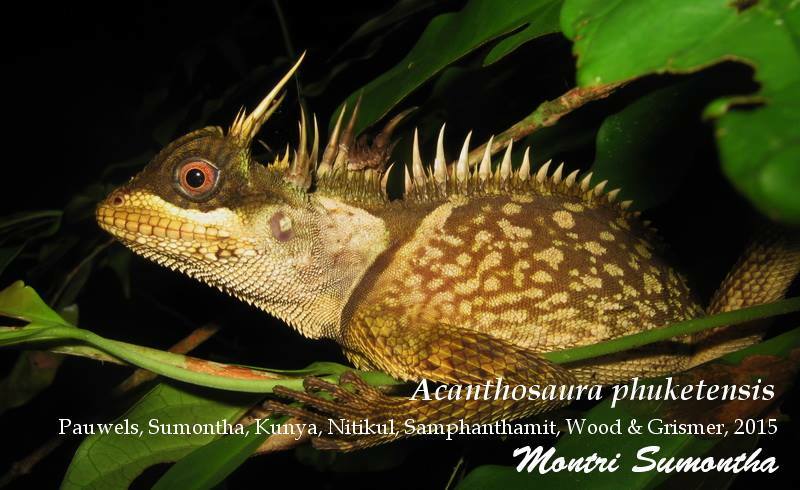 2008), and the total number of recognized Acanthosaura species will keep increasing (Sumontha et al. in prep., Wood et al. in prep.). The main conservation threat for A. phuketensis sp. nov. is probably forest logging and degradation. Fortunately, it has already been reported from several protected areas, i.e., Khao Phra Thaeo Non-hunting Area in Phuket Province, Khao Lak - Lam Ru National Park and Phang-Nga Wildlife Breeding Station in Phang-Nga Province, and Khao Sok National Park in Surat Thani Province. It will probably be recorded from Kaeng Krung National Park, Khlong Phanom National Park and Khlong Yan Wildlife Sanctuary in Surat Thani Province, Khlong Nakha Wildlife Sanctuary in Ranong Province, and Si Phang Nga National Park and Ton Pariwat Wildlife Sanctuary in Phang-Nga Province, all offering forested areas and lying within the Phuket Range. The last forested areas on Phuket Island are currently subject to strong pressure because of unregulated infrastructure development and land use (Boupun & Wongsai 2013). The high reptile diversity of Phuket Island (Frith 1978, Pauwels & Bauer 2001, Sumontha et al. 2002a-b, Leong et al. 2003, this work), including three endemic forest dwelling species (Cnemaspis phuketensis Das & Leong, 2004, Cyrtodactylus phuketensis Sumontha et al. and Trimeresurus phuketensis Sumontha et al. ), stresses the importance of preserving the last patches of primary and mature secondary forest remaining on the island. Our research team has intentionally given a specific epithet relating to Phuket Island to each of the three squamate species we described from the island in order to draw the attention of the scientific community and Government stakeholders to this need to locally improve current conservation efforts and land use planning. Nice article on a new species of Herpetofauna, Thought I would point you at another from this year from Indonesia and New Guinea.